Cipla Ltd is all set to replace its entire range of products containing chlorofluorocarbons (CFC) two years ahead of the Montreal Protocol ban deadline. The move is significant because Cipla has a 70% share of the inhaler market in India. In addition, it is the third largest company, by sales, in the anti-asthmatic inhaler drug market, behind GSK Plc. and AstraZeneca Plc. Cipla sells these products in 40 countries, including Australia, New Zealand and Latin America. Cipla chairman Y.K. Hamied told Mint that the company will be able to replace all its CFC products with hydrofluroalkaline (HFA)—or dry powder drug substance—technology by early 2008. According to Hamied, Cipla has already developed the necessary technology for the conversion and some of the products are completing clinical trails within India and overseas. “Though the technology shift will cost us more, we are committed to comply with the international norm as early as possible," he said, noting that the company has already launched two CFC-free products in the domestic market. “The technology change in our major inhaler manufacturing plants is almost complete now," Hamied said. Cipla currently produces inhaler drugs in factories located at Goa, Kurkumbh, Sikkim and Baddi. A senior official from Cipla, who did not want to be quoted, said: “Though there were reports that the companies who comply with the deadline early will be eligible for industrial incentives from respective governments, we haven’t heard of any such benefits so far from the government. “There will be a slight increase in prices of the new products due to the high cost (about 15% to 20% more) in the new technology. We hope the National Pharmaceutical Pricing Authority (NPPA), the drug price control body in India, would permit the cost escalation," he added. Two drugs—Salbutamol and Theophylline, which are used in anti-asthma inhalers—fall under the Drug Price Control Order. An NPPA official, who also didn’t want to be quoted, said the department has already worked out some solution to allow different pricing for CFC and non-CFC inhalers in India. The NPPA notification to this effect will be out soon, he added. The anti-asthma segment is growing at more than 20% per annum, mainly due to an overall increase in pollution that is leading to a spurt in the number of asthma cases. One of Cipla’s major products, the Asthalin inhaler, has annual sales of at least Rs40 crore, with a domestic annual growth rate of at least 30%. In the anti-asthma segment, inhaler therapy is preferred to tablets since the dose required is about one-tenth of an oral dose. The inhaled drug directly goes to the lungs, often giving instantaneous relief. About 25% of Cipla’s total revenue comes from anti-asthma drugs. Cipla has also recently developed a new variety of inexpensive Rotahaler and spacers. 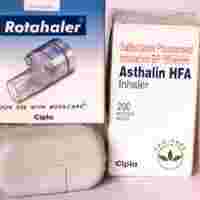 The Rotahaler is based on dry powder inhalation, compared with regular inhalers which use propellants for the drugs. The spacer is a plastic device that helps in slow inhalation of drug from the inhalers. The company has applied for international patents for both these products.